Ever wished you could have a pergola in your house, but you don't have the right material or know about the installation process or even what key elements you need to start? Sometimes ignorance can ruin your beautiful work, so today at homify, we want to show you how you can acquire your very own pergola. It's not complicated if you take into account some of the recommendations that we offer you today! 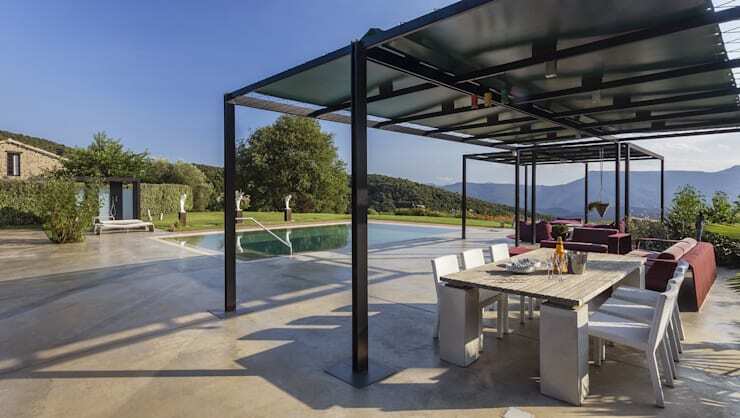 Pergolas have a very specific use, depending on where you want to install them, the type of material that you prefer and the design that you like. Most pergolas are built in courtyards or gardens, where the main function is to create an area that allows the house to be expanded. Here you can enjoy the weather, even in the rain or the sun, while under shelter. You can eat, entertain or read your book with a cup of coffee. 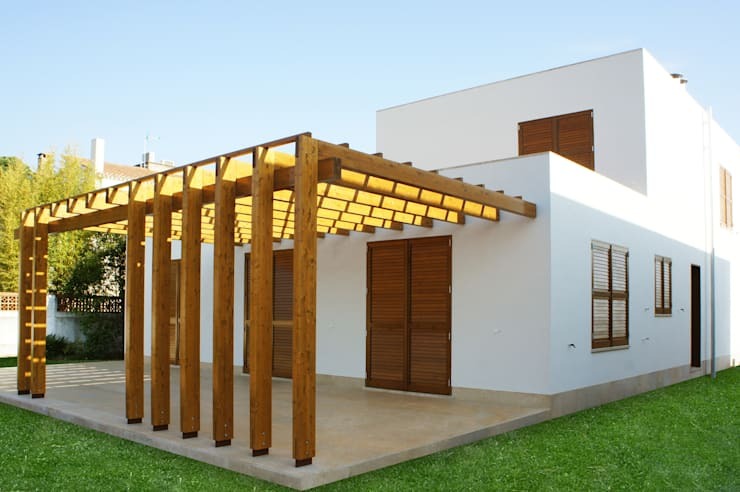 The most commonly used materials when it comes to the pergola are wood, iron, aluminum, brick and even concrete, although the latter is a bit heavy. How do we know what size we should build our pergola? This is one of the most common questions! First you must measure the area where you want to install it. You'll most likely go for a rectangle or square area. 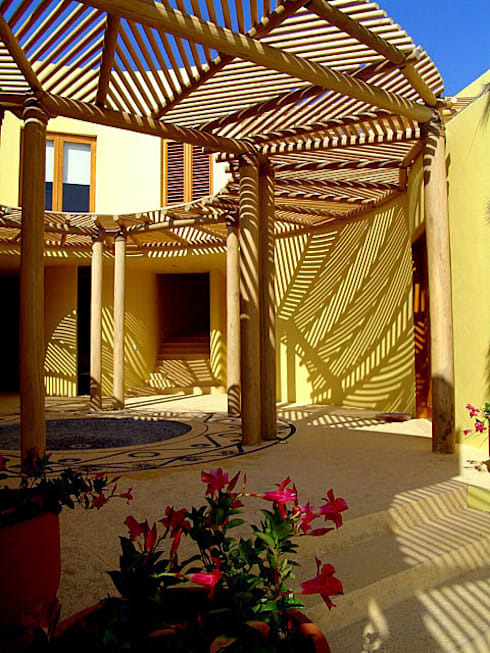 Usually pergolas are about four metres long and two metres wide. You want to be able to fit a nice set of terrace furniture underneath such as a garden dining set, chairs and armchairs. You also need to work out where the wooden poles or support beams will go. This will form a column longitudinally, keeping the structure sturdy and in tact. There are many types of pergolas, depending on the style that you prefer for your home and your garden. 1. The classic style—a very common model that features an open wooden roof with perpendicular beams. 2. The romantic style—this employs more round shades with scrolls and floral motifs and can often be found in more rustic-style homes. These may also feature carved wooden columns. 3. Modern pergola—it has a simpler shape than the rest, with materials like aluminum, brass and iron used. 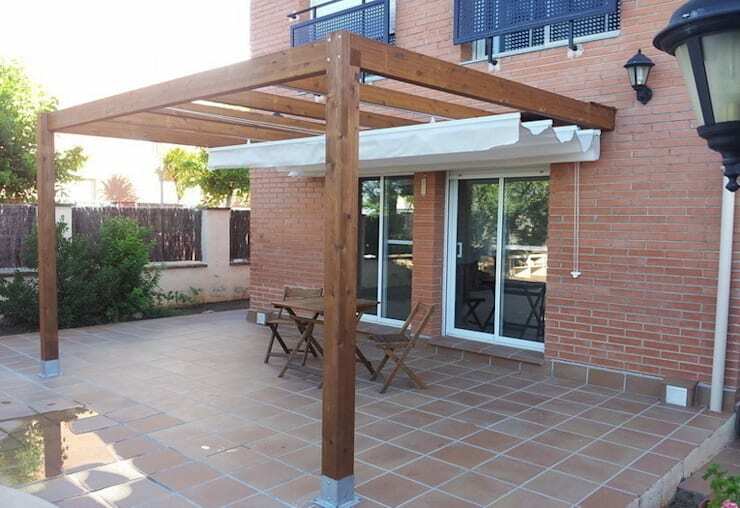 Pergolas are commonly made of wood, vinyl or wrought-iron. All are durable materials, each with its own advantages and disadvantages. For wooden ceilings, polycarbonate is often used. 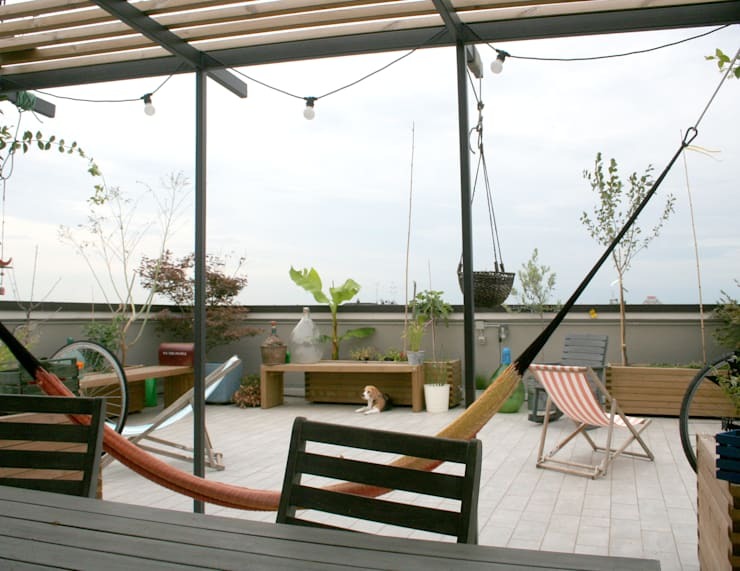 You can also adopt a cane pergola, which adds that rustic look and feel to this structure. Soft woods like pine are also widely used, but they are not very weatherproof. In the South African climate, it would be better to go for a hard wood. In relation to the types of ceiling or roof that you go for, you need to consider the type of pergola that you want as well as the environment in which it will be placed. As discussed previously, you can opt for polycarbonate ceilings with UV protection. Also, depending on the area you live in, you can speak to a design professional about utilising recycled or organic materials such as aluminum, iron and metal. Remember the harder and more dense the material is, the hotter it will get under that ceiling! 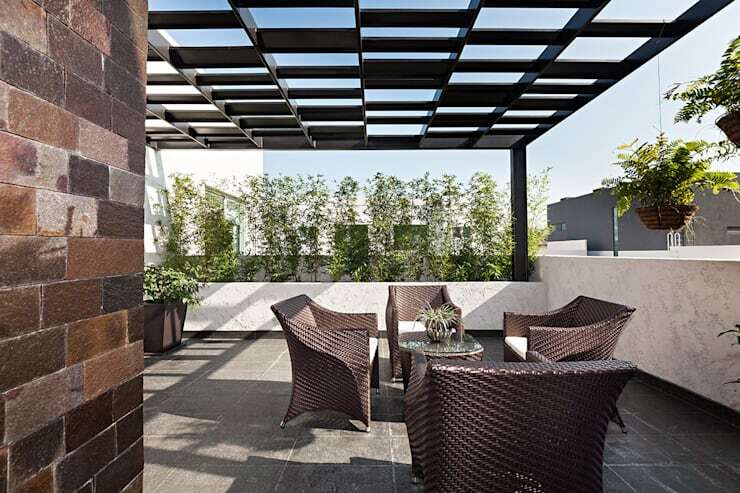 Have a look at these 10 stylish ways to catch some shade for inspiration. When it comes to accessories in your pergola, we recommend that you choose materials that are going to be well-supported in all climates including the sun and the rain. The furniture that you choose should be durable but not heavy. They are so many unique and avant-garde designs that you can go for. In terms of lighting, we recommend installing artificial lights on the roof as well as a lamp that matches the rest of the furniture. As for natural light, candles will never go amiss! They give a very romantic and idyllic ambiance to this space. In summer, don't forget the electric fans! 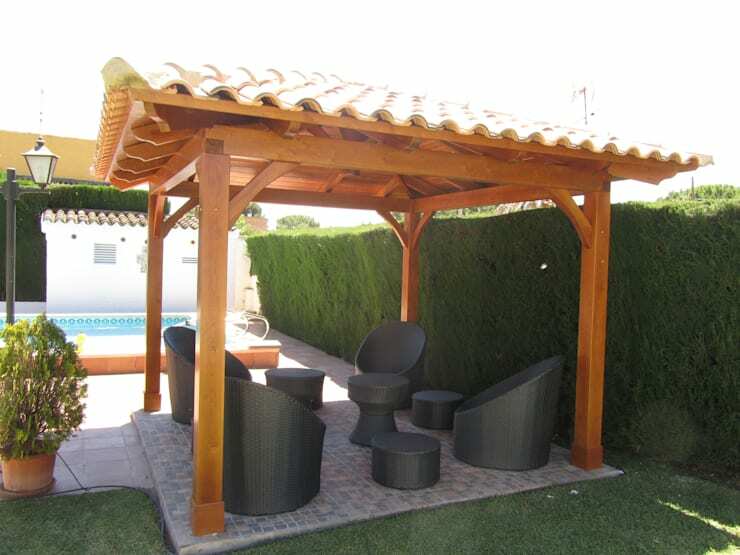 In this design, we can see how designers Atico Y Jardin, have created this beautiful wooden pergola that is of high quality and his perfect as the ideal leisure space, with its clay roof. The furniture underneath fits perfectly! The designers have also gone for durable plastic furniture that is dynamic and stylish. When it comes to opting for a feature like this, you need to think about the budget and work out how much each piece is going to cost as well as what materials you need. We suggest you chat to several local pergola builders and get different quotes, which you can compare. For a cheaper option, go for cheaper materials. Also have a look at this: Beautiful pergola, whatever the weather!